An American often associated with French artists. 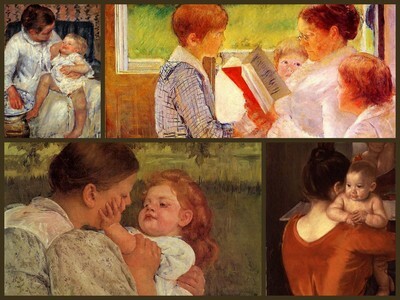 A single woman famous for depicting maternal love. Today is a day of mingled grief and joy. the security of being firmly held. This entry was posted in Uncategorized and tagged fineartfriday by alivingpencil. Bookmark the permalink. now ya made me cry…Thank you! really, it is the kind of cry that is good! I’m waaay behind; Mother’s Day is long past. During my long years of infertility, it was always the worst day of the year for me. Now, with my nest full, it is a day of rejoicing. I do hope, though, that the pain that left a mark on my heart will enable me to be a vessel of comfort to other women who experience the void that exists b/c of the loss of a mother or an empty womb. The Cassatt art was a perfect compliment for these thoughts. Thank you, Carol!